Finding fixtures to coincide with the family holiday to the Algarve was not proving to be an easy task. Like most European nations, it's still pre-season, but in Portugal, the publicity around such friendly games is patchy to say the least. Portugal however, notably the Algarve, is a favourite destination for many English clubs who fancy a bit of a training camp and the odd game or two, Sheffield Wednesday for example in the week prior to our holiday played a couple of games in the area, but unless you were from Sheffield, there was no easy way to find out who, what and where it was all happening. 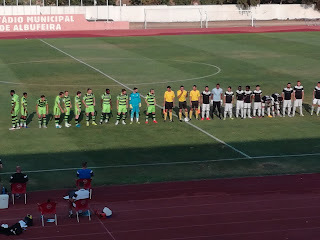 My knowledge of football in Portugal isn't fantastic, and only by having holidayed at the same venue last Summer did I know that the two most senior clubs in the area are Portimonense and Farense (both were indeed visited for games). 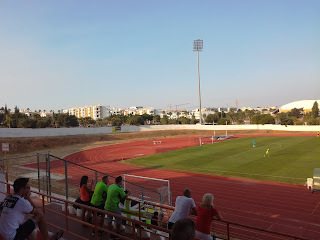 Portimonense had a game on the Thursday against FC Porto and that was being played at the Algarve Stadium, plans were in place to try and get tickets for that game, but more on that in the next blog. 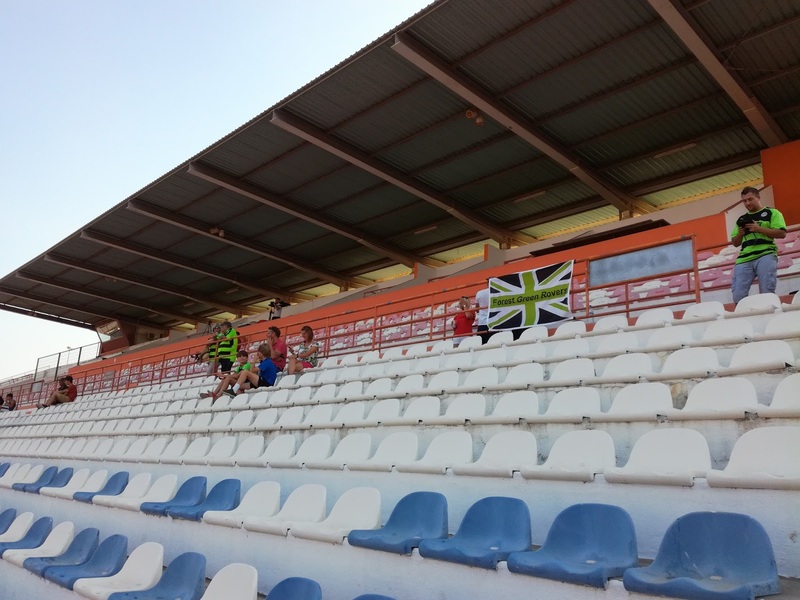 Farense were very quiet on the publicity front though, but then on the Tuesday afternoon I was having a quiet beer looking on my phone for footballing opportunities, when I saw on their website that they were playing host to Forest Green Rovers that night, and not only that, the game was being played fifteen minutes away from our resort in nearby town of Albufeira. I double checked the FGR Twitter feed and yes, I had the makings of a plan! 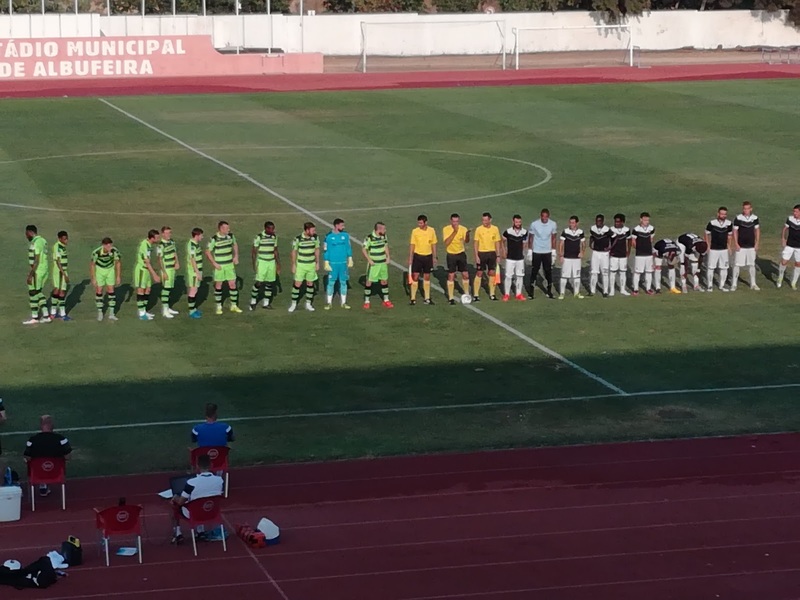 Farense play home games in Faro, but like a lot of sides in pre-season, this game wasn't being played at their usual home ground, but it was being played at the Estadio Municipal in Albufeira, which incidentally had been the venue for Portimonense v Wednesday. The traditional occupants of this stadium are a team called Imortal Desportivo Clube, who strangely enough I'd only been checking up on earlier in the day to see if they had any games. 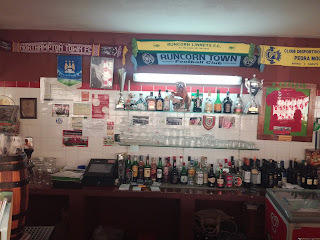 There was nothing around the stadium as such so I made my way to a built up area and soon found the Belmonte Hotel, that was as good a place as any for a pre-match Super Bock. Back to the ground and with a few more spectators now in place, and a fair sprinkling from England, it became noticeable that the club bar was in fact open, happy days indeed, but from looking at the scarves on the wall it seemed both Runcorn Linnets and Runcorn Town had beat me to it! 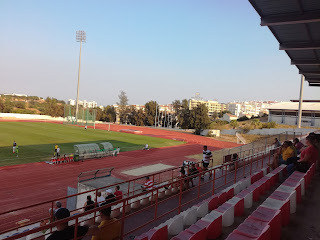 The Estadio Municipal is a big sports arena with the obligatory running track around the pitch. All of the facilities are on one side comprising a large seated stand, with extended uncovered seating at either side of the main covered area. The FGR fans had taken up a position to the left of the players tunnel and I chose to sit in close proximity. Just under 200 turned out to watch it, with around 25 - 30 or so following the newly promoted Football League club. Farense took a very early lead and to be fair, looked the more comfortable side in the first period. Farense have just been promoted back to the second tier of football in Portugal so you would expect them to be a pretty accomplished outfit and indeed they seemed to be just that. The second half for the most part was largely uneventful, Rovers showed a bit more inventiveness but as is typical the game was punctuated by numerous changes. Farense grabbed a second goal late in the game only for the visitors to pull back a consolation effort almost in immediate fashion. A fair result in my view, but given the fact the Super Bock was going down an absolute treat, it did start to get a bit hazy towards the end (plus the heat factor of course!). My taxi was waiting for me at the final whistle, as were Rachael and George when I got back to the resort, and all I'll say is, it's a good job she's tolerant of my indulgent nature! Imortal? The boys from Albufeira might be, but this boy was on thin ice......!